Does it sometimes seem like your prayers stop at the ceiling? Praying is hard enough without knowing exactly how to do it. How is a Christian supposed to pray? 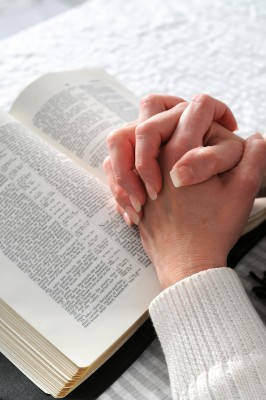 Are there ways to make our prayers more effective? Praying is simply talking to God as a child would to their father. Rather than thinking of prayer as changing God’s mind it is really about changing us. It is about making our will conform to the will of the Father. Jesus gave us not only the model of prayer in what is considered the Lord’s Prayer but He also showed us Who to pray to. Jesus said that we are to pray to the Father but in Jesus’ name as He is the Mediator for us. Jesus’ name gives us access to the Holy of Holies at the Throne of God. The disciples asked Jesus how to pray and He began the instruction with “Our Father in heaven” (Matt 6:9). In John 16:23-27 Jesus says, “At that time you won’t need to ask me for anything. I tell you the truth, you will ask the Father directly, and he will grant your request because you use my name. You haven’t done this before. Ask, using my name, and you will receive, and you will have abundant joy. I have spoken of these matters in figures of speech, but soon I will stop speaking figuratively and will tell you plainly all about the Father. Then you will ask in my name. I’m not saying I will ask the Father on your behalf, for the Father himself loves you dearly because you love me and believe that I came from God.” It is clear that we must pray directly to God the Father. This is repeated several times elsewhere by Jesus; that is Jesus’ direct instructions to His believers. In Whose Name do we Pray? We are told by Jesus Himself to pray to the Father and to ask the Father for our needs but we must ask in His name because only Jesus gives us access to God the Father. Why? Because as our High Priest, He gave His life for us and by His sacrifice, He is now our Mediator in heaven before the Father. Prayers will not reach the Father unless you pray through the name above all names: Jesus Christ. There are dozens of Scriptures where Jesus tells us that we must pray to the Father using His name but we also see that the apostles used His name, well after Christ‘s Ascension. Adoration of God’s Holy Name and His holiness, His goodness, His omnipotence, His sovereignty. The Lord’s Prayers says “Hallowed be your name.” Hallowed is an old English word that means His name is to be sanctified, set apart, holy, honored, revered, and greatly respected. Confession of sin, guilt, falling short of God’s holiness. To confess our sins means that we agree with God about our falling short of the mark. Sin means we miss the mark and we fall short of His holiness. We confess our sins and even those unknown sins that we may have inadvertently committed. Sins of omission and sins of commission are included. Thanksgiving. To give thanks to God is actually pleasing to Him and is the very will of God. In 1 Thessalonians 5:18 it says we are to “give thanks in all circumstances, for this is God’s will for you in Christ Jesus.” It says to give thanks in all circumstances because giving thanks is God’s will. We thank Him for our blessings, our trials, and “always giving thanks to God the Father for everything, in the name of our Lord Jesus Christ” (Eph 5:20). Supplications or requests for others. I like to use JOY for praying. First, praying for Jesus to be glorified, then praying for Others, and lastly praying for Yourself. If you read the Lord’s Prayer and even Nehemiah’s prayer (Neh 1:5-11) they first glorify God and praise Him, then a confession of guilt or sin is made, which is followed by thanksgiving to Him for all He has done, and only after all of this are requests or supplications made to God. Notice several things here. David confessed his sins because if we have any sins for which we have not repented, God may not be attentive or may not answer our prayers. Before David began to pray he asked for forgiveness and to be cleansed from his unrighteousness. There are also several prayers in many of Paul’s letters. Many of his letters begin with and/or end with prayer. Paul never asked for physical needs but always for God to be glorified and he always prayed for the members of the churches he planted. Paul prioritized prayer in a way that the gospel would be proclaimed and the churches would grow in grace and knowledge. One thing that appears absent from Paul’s prayers are prayers for himself. The only exception is that he would have an open door to preach the gospel more boldly. Paul prayed for God’s will to be done just like Jesus did prior to Calvary. We see that we need to pray to God the Father, to pray in Jesus’ name and we see how we are to pray: In Adoration, Confession, Thanksgiving, and Supplication. The Bible is full of wonderful prayers especially the Book of Psalms is full of prayers that you can pray back to God. And finally, we need to make sure we are not regarding sin before we come to the Throne of Heaven and to also pray for God’s will above our own. His will is clearly to receive thanksgiving from us and to glorify His Son’s name, Jesus Christ. That is how we should pray. My prayer is for anyone who is not saved to place their trust in Jesus Christ as Lord and Savior and have saving faith in His ability. Jesus’ will for you is to give you eternal life. Looking for some other great answers and questions? Thank you Mabel for your kind words. Please visit us again soon. A wonderful article on an often neglected, but incredibly important, aspect of the Christian’s life. Great job, brother. THanks brother….I need to use the JOY acronym more to put others first…and not make it a “me-centered prayer” but a He centered one. I have been praying for you too brother. This was an inspiring article Jack. Thank you for this. I am forever grateful to our Father in heaven. He is worthy to be praised and I know that I don’t always pray with thanksgiving. Thank you for a great reminder. I will definitely keep thanksgiving on my heart when approaching His throne in prayer. Amen Derek. He is most worthy. He is an awesome God and the word “awesome” should be copyrighten to God alone for the word means “worth praise.” Thanks brother. Thanksgiving is the only freewill offering in the Bible and since its not obligatory in the Old Testament, I think it was most precious to God. Thank you so much Dianne. I know that when I pray I get spiritual attacks and interference from the Enemy and I still feel weak in my prayers at times. When I least feel like praying, are the times that I most need to. God bless you there Dianne in South Africa. Why did Jesus in Luke say in The Lord’s prayer to “lead us not into temptation” when we are told in James that God does not tempt us with evil, we only tempt ourselves. Thank you Steven for the question. I believe that it is a prayer that is better worded, God, do not allow us to go into areas where temptation might overcome us. Using biblical hermeneutics, it could be to bring us not in to sore trial. PEIRASMON, which may be here rendered sore trial, comes from PEIRW, to pierce through, as with a spear, or spit, used so by some of the best Greek writers. Several of the primitive fathers understood it something in this way; and have therefore added quam ferre non possimus, “which we cannotbear.” The word not only implies violent assaults from Satan, butalso sorely afflictive circumstances, none of which we have, as yet, grace or fortitude sufficient to bear. Bring us not in, or lead us not in. This is a mere Hebraism: God is said to do a thing which he only permits or suffers to be done. Does this make this verse make more sense now Steven? Yes Jack, it makes a lot more sense. Thank you for clarifying that for me. You are a powerhouse of scripture knowledge. The truth is prayer is all about talking the word and praying in the spirit and God speaking to you prophetically. Prayer gets more deeper when you are always listen to God at all times and communing with the Holy-Spirit. Thank you very much for this articles, there are things that we tend to overlook but they are very important in our spiritual life. Thank God He sent Jesus, His only Son to this world. He taught us how to live and many other things like this one of how to pray. I love to encourage you brother Jack to continue the good work, I happened to find this website when I was looking for a Christian advice regarding marriage because some of my female friends were having problems in their marriage, one had already seperated. I always seek the Bible answers in every situations and topic. This article is helping me in my spiritual life as it becomes a tendency sometimes that I earnestly seek God when things are getting tough in life and relax & chill when the road is smooth. God is good. Thank you and the team very much for this website, it is informative. May the Almighty of Israel bless you abundantly. Oh My God. Thank you for this wonderful article Pastor Jack Wellman. I had just finished my night prayer and as usual asked God to teach me how to pray. Little did i know that was surely gona answer the moment i turned my computer on. This has been an eye opener and a wonderful experience, i feel revived and spirit filled as i write i can now prayer for as long as i have breath. Dint have that concept whatsoever(ACTS) Am so happy read these powerful and instructive readings and hope to pass onto God’s children. Hello Joy and thank you so much and greetings to you and God bless you in Uganda. Awesome to have you here. I love your comment. You are such an encouragement. May God richly bless you and your prayers my friend. Your Welcome Pastor Jack Wellman and God bless you more. This article speaks to billions of christian’s who are or even worse than me in prayer. A wonderful article on an often neglected, but incredibly important, aspect of the Christian’s life. Am already beginning to experience the weight and impact of my prayers in my life. I was soo excited when i read your article i had to print it out and give handouts to my collegeus. And all of them thanked me for sure but i told them to thank God instead. Greetings Ptr. Jack. Im greatly blessed of reading your article. As christians we should be reminded of the ACTS prayer pattern. Because we have the tendency to pray for ourselves, our needs more than glorifying our God. Thank you im revived and excited to share this article to our prayer meeting group. To God be the glory! Hello Sheila and greetings to you from the States to you fellow Christians in the Philippines. I love your comment and you got it! Yes, we need to be praying for others first and put ourselves last and one most important thing you said that many Christians overlook in prayer. That is that God is glorified above all things. He must increase, we must decrease. Amen to your words. You show such godly wisdom and your Bible study group is blessed to have a woman of such strong faith as you! More of You (God) and less of me. All praises and thanksgiving to God! Salamat. Thanks so much for such a spiritual reviving article,its apetising.Praise God. I would simply say “we” in the congregational prayer and “me” or “I” in the prayers between you and God. A great example of a corporate prayer is the prayer Nehemiah gave about revival in Neh. 1:5-11. I like to read prayers of the Bible when I pray before my sermons and I love Psalm 51, Nehemiah 1:5-11 but there are so many prayers that can be used. God loves it when we pray back the Psalms to Him because we know they are inspired when we may not be. O Lord God of heaven, the great and awesome God who keeps covenant and steadfast love with those who love [you] and keep [your] commandments, let your ear be attentive and your eyes open [to us], to hear the prayer of your servants that I now pray before you…for [your] people [in this church] your servants, confessing the [our] sins of [your church], which we have sinned against you. Even [me] and [those here] have sinned…. Check this against the first portion of Nehemiah’s prayer and see how I put the “we” and “me” and “us” into it to make it our own and relevant to the church and Christians today. Hope this helps sir. Notice how you can change it to customize it to your own church and also to the “me” or “I”. Thank you Pastor Jack so much. Many Almighty God bless you and protect you and your family. Thanks for the fast response, I agree with you 100%. I pray that the people who listen to to your sermons and read your comments understand what a God fearing man you are. Bro Andrew or (pete), pete short for Peterson. Again thanks and may God bless. Thank you so much my good friend and brother in Christ. I believe prayer is becoming more and more important for the days are becoming increasingly evil. I appreciate godly men of faith like you as prayer warriors. Jack, I know you are a verry busy man. Simply put I am going through a termoil with some family problems. Please if you would be so kind to pray for me. I just read your article on how to pray and for the first time in my 57 years it makes since. God forbid that I should ever be too busy to pray for a fellow saint and so indeed I will….count on that. God can do all things and when we pray the strong name of Jesus, He is glorified….that is what I will do Mr. Overstreet. Please know that I care my brother. Thank you Jack….very clear and encouraging post! Thank you Kris. It is very clear to me that you are such an encouragement and it was great to hear from you again. You are very encouraging my friend. Thank you for your edifying words.